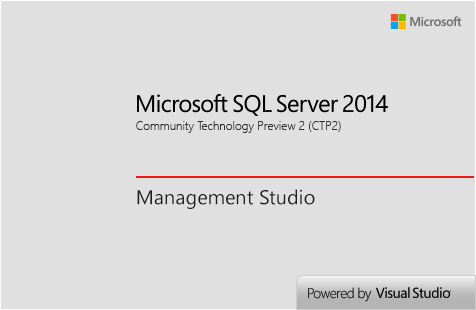 Microsoft released the most recent SQL Server data platform version SQL Server 2014 RTM on the first day of April, 2014. SQL Server database professionals can download free SQL Server 2014 public available trial download editions from Microsoft TechNet Evaluation Center. To download SQL Server 2014 free trial version, all you have to do is to login with your Microsoft passport like a Microsoft Live account, etc and then register for SQL Server 2014 download. You have the option to download 32-bit or 64-bit SQL Server 2014 setup binaries. Chinese (Simplified), Chinese (Traditional), English, German, Japanese, Spanish, French, Italian, Korean, Portuguese (Brazil) and Russian. SQL Server 2014 RTM release (final release or official release of SQL Server 2014) in English language can be downloaded as an .ISO file format setup binaries with iso file name SQLServer2014-x64-ENU.iso and around 2.3 GB in size. SQL Server 2014 release date is announced as 1st of April, 2014 by Quentin Clark the Corporate Vice President of Microsoft Data Platform Group. SQL Server 2014 In-Memory OLTP has already been delivered for manufacturing and will be public available on the first day of April, 2014. I hope there will not be a April Fools' Day joke for both SQL Server Data Platform group and for SQL Server professionals. 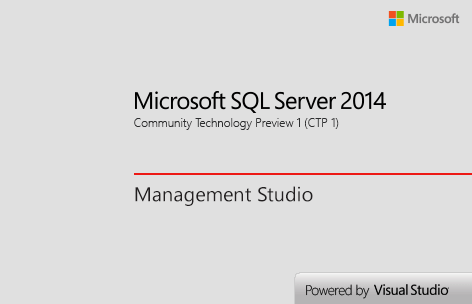 For the official SQL Server 2014 release date announcement, please read the blog post at The Official Microsoft Blog. Microsoft announced SQL Server 2014, new version of SQL Server which brings in-memory OLTP (OnLine Transaction Processing) features especially for SSRS, datawarehouse and Big Data analyses during TechEd North America on 4th of June. The first public preview release of SQL Server 2014 CTP1 is available since 25th of June for free download and evaluation of database professionals. After the first release CTP1, a second public available release is anounced recently for SQL Server Data Platform professionals which is SQL Server 2014 CTP 2. In-memory OLTP requires creation of memory optimized tables and related natively compiled stored procedures for using performance boosting in-memory operations in your OLTP (Online Transaction Processing) database. After database professionals, T-SQL programmers, database administrators or BI developers download and install SQL Server 2014, they can also download sample database AdventureWorks2014 for SQL Server 2014 to test SQL Server new features on the demo database of SQL Server data platform. For Business Intelligence developers working on the SQL Server Data Platform, they will require to download and install SQL Server Data Tools before they start building Business Intelligence projects on SQL Server 2014 database instances using Visual Studio 2013. SQL Server Data Tools will install Business Intelligence project templates on Visual Studio 2013 required for SSAS, SSIS and SSRS development on SQL Server 2014. By downloading SQL Server 2014 CTP2 and installing it on a test machine, SQL developers and database administrators can play with the new in-memory OLTP features of the new SQL Server release. 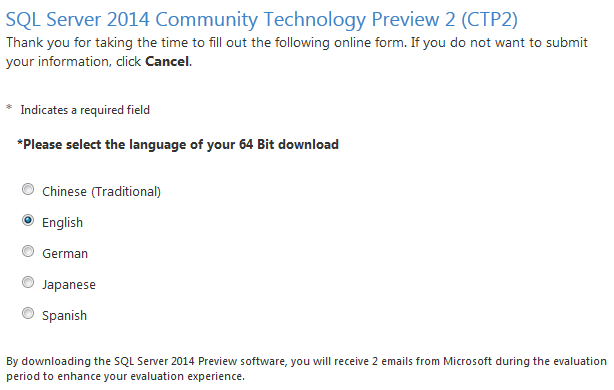 Build number for SQL Server 2014 CTP2 release is 12.0.1524.0 . For my SQL Server 2014 CTP installation on Windows 7 PC the @@VERSION system parameter returns as "Microsoft SQL Server 2014 (CTP2) - 12.0.1524.0 (X64)"
Microsoft has released public available SQL Server 2014 download for data professionals. Although the final release of SQL Server 2014 and SQL Server 2014 release date for RTM version is not clear yet, data professionals can enjoy the features with SQL Server 2014 CTP1 introduces. Especially the new in-memory capabilities introduced with SQL Server 2014 will be the major interest point for many SQL Server data platform users. SQL Server database administrators, SQL developers and Business Intelligence (BI) professionals can download SQL Server 2014 from Microsoft Download web portal or from TechNet Evaluation Center.